Habitat for Humanity of Greater Newburgh dedicated the Santiago and Cordero-Valencia homes on Chambers St. in the City of Newburgh on Saturday, June 9, 2012 to complete the week long Builders Blitz. 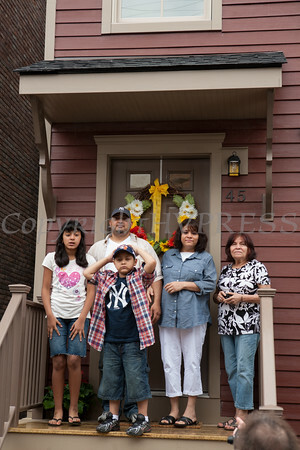 Ashley Santiago, Moises santiago, Moises Santiago, Jr., Faviola Santiago-Diaz and Florenzia Benitez on the front steps of their new home following the Habitat for Humanity of Greater Newburgh dedication of the Santiago and Cordero-Valencia homes on Chambers St. on Saturday, June 9, 2012 to complete the week long Builders Blitz. Hudson Valley Press/CHUCK STEWART, JR.